This post has been a loooooooooooooong time coming. Actually, there probably aren’t even enough Os in that word. I consider myself to be the Queen of buying on the cheap. I love nice things in life but I am way too practical to purchase these things new. Nearly new, yes. Honestly, there is no way I could afford to live at the level that we do without estate sales. Just like Costco and Walmart, they enable me to live beyond my means without sacrificing my budget. I basically refuse to pay retail on almost everything. In fact, I pretty much buy most things used. Furniture, household goods, jewelry, kitchen gadgets, clothing - even shoes! I buy them all used. My personal line in the sand is food and underwear. I am not looking to share a half-eaten sandwich with a total stranger. Or share underwear. But that’s it. Everything else I try to buy used at a significant discount. Which mostly means more than likely, I’ve bought it at some estate sale somewhere. I freaking LOVE estate sales!! It’s a whole crazy day of galavant anting around an absolutely stunning mansion, feeling like a princess and seeing how the other half lives. When you first walk in, these homes often look like a museum - with top of the line furniture, household accessories and amenities. I mean the works - these people were living large. Dave and I have seen some pretty incredible stuff in the years that we have been going to estate sales - one house had a library with all the critters the man had hunted over the years. In the middle of the room was a full-sized lion, and the walls were adorned with a host of other species. This same house literally was adorned with gold on the ceiling - a fancy version of McDonald's golden arches - not my style, but hey. It was interesting. Nonetheless, walking through these magnificent homes affords opportunity to view fine craftsmanship and the ultimate in gaudiness and/or fine taste. In addition to whatever goodies we found for a couple hundred bucks, we take home some great ideas too - sometimes you see a great way to organize something, or you mimic the color scheme that you have seen used in other homes. These women all had designers plan this all out for them. And everything is stunning. If you're lucky you can score the whole room, including the little touches that made it feel cozy. But first - I have to get the icky part out of the way. Estate Sales are held when people die. The owner or owners of the home have likely passed away and nobody wants the stuff. They are unloading every-thing to get the house ready to sell. That means they sell all the good stuff too - not like garage sales where someone is just dumping their unwanted items on you. For those who are a bit squeamish about such matters, there are times when the folks are alive too - they may be downsizing or moving into a place where they can get more help, now that they are older. I have seen couples moving overseas and couples who passed away in the prime of their lives. It happens folks, and there isn’t any way to put a smiley face on it. People die. But hey -- they don’t need all that nice stuff where they’re going. And someone is going to get those awesome deals, why not let it be you? I figure it’s honoring their lives in a small way. And honoring their good taste too - I might add ;-). Yes, it can be a bit like a feeding frenzy of vultures on a fresh kill. But the prices are so good, you’ll get over that quickly! Trust me on this. It’s like the most fun you will ever have for less than $100! And then you get to bring it all home and use it yourself. And that’s called smart. Living large on a LOT less. Estate sales are advertised well in advance, so put it in your calendar. Review the photos and see if there’s anything you’re interested in. When you sign up for alerts, the estatesales.net sends you an email on Wednesday so you can plan your strategy for the upcoming weekend. If you set up an account on estatesales.net, you can keep track of your favorite sales and your favorite items at each sale. That way, you can see how far a drive it is and once you’re there you are completely focused when you came for. New table lamps to match your existing decor? No problem! And you can likely score it for about $25. All professional estate sale companies include a photo gallery and inventory listing of all the goods, so you get to choose which one has the coolest stuff. Often the pictures give you insight into not only the style of the furniture but how well things have been kept. If there’s a whole pile of stuff in a heap in the garage, odds are they weren’t taking good care of the stuff. Sometimes you can find more information listed on the company’s website that is in charge of the sale.. Inventory listings will include basic information including the name of the manufacturer. Get to know the top brands in each category. I’ve got lists for household appliances, tech supplies and electronics. Also, if you’re into collectibles or antiques, there are often some very unique items being offered. Wealthy people like cool stuff in their collections and the only reason that it’s being sold is because they no longer need it. 2. Sign Up for Alerts in Your Area. First stop is to go online and sign up for notifications of weekly sales. Register for email alerts in your geography on https://www.estatesales.net/. It’s a national search platform, so you can tailor the searches however you’d like. The sales typically run a couple days and often start on a Thursday or a Friday. Best part is that you can see pictures of all the stuff online before you even have to worry about finding your car keys. Wealthy people have cool stuff. Then there’s the inventory list. Love these! With a little pre-planning and research, you can look up what items typically sell for at retail and what the dimensions are, so you can know if that beautiful couch will fit in your den. Enter your zip code or the zip code of the fanciest, pancy area in your locale. You don’t want to buy just anybody’s stuff. You want to buy the RICH dead people’s stuff!! I’m lucky to live on the outskirts of one of the wealthier neighborhoods in our city. I can’t even believe some of the expensive pieces of furniture I find for total chump change regularly. I have scored such crazy deals -- just recently I scored a solid granite tabel. A large one - the nlmovers thought it weight about 400 pounds. It was a beautiful square solid granite table and 8 high-end leather chairs from Germany and I paid only $250 for it. Will it fit? Is it really the right one? If you are asking either one of these questions in your head, then don’t do it! How can I get it home. That you have time for. Some time at least. 5. Make sure to check out the pictures online before going anywhere. There are hoarders out there too. ‘nuff said. Bedroom furniture? Or floor rugs? Sizes are important, so make sure you measure. I keep a little kit in my car - I bring a tape measure and recyclable grocery bags so that I don’t have to walk around holding a million little things in my hands. There are certain items that you can’t go wrong with - small appliances (make sure they work), linens and bedding, holiday decorations and cards and clothing. Wealthy women wear nice clothing and shoes. Often I wait to get everything home before I even try it on. Hey, if it doesn’t fit, I can easily drop it by a consignment store and make money on that $4 Anne Klein blazer that makes me look like a linebacker. Many times the items haven’t even been worn at all. Score! New Anne Klein blazer for $4. How could you go wrong? If it’s too heavy to lug around with you, you can have them hold it for you at the cash register. 8. Look in every room throughout the house. You never know what you’ll find. Or where you’ll find it. Sometimes they set up the cashier next to the jewelry, in the garage. 9. Make sure the price is right. Negotiate. But don’t be a jerk about it, especially if you’re already getting a screaming deal. Just remember - there’s a difference between negotiating and just being a jerk. ‘Nuff said. This is a business deal, just like any other and the first thing you want is a win/win situation for all - unless you don’t really care about ever doing business with that person again. 10. Look for quality and workmanship. I’ve learned about beautiful quality fabrics by the drapes that I’ve bought for our own home. Get to know the standards of quality furniture manufacturing, like dovetail drawers. Dovetail Joints are a sign of quality workmanship. A dovetail joint or simply dovetail is a joinery technique most commonly used in woodworking joinery (carpentry) including furniture, cabinets. log buildings and traditional timber framing. Noted for its resistance to being pulled apart (tensile strength), the dovetail joint is commonly used to join the sides of a drawer to the front. A series of 'pins' cut to extend from the end of one board interlock with a series of 'tails' cut into the end of another board. The pins and tails have a trapezoidal shape. Once glued, a wooden dovetail joint requires no mechanical fasteners. The dovetail joint, also known as a culvertail joint, probably pre-dates written history. Some of the earliest known examples of the dovetail joint are in ancient Egyptian architecture entombed with mummies dating from First Dynasty, as well the tombs of Chinese emperors. The dovetail design is an important method of distinguishing various periods of furniture. In Europe the dovetail joint is also called a swallowtail joint or a fantail joint. Look for dovetail joints whenever you’re out there looking at second-hand furniture. Everytime and anywhere, furniture with dovetail joints will last much better than furniture without dovetail joints. So back to estate sale shopping, So it’s game day, and you’ve got cash and bags in hand. It typically pays to be there early because you literally get first pick. You’re ready, in fact - your early to the party. Expect there to be a line for the best sales, Sometimes there’s as many as 50 people already waiting. Please keep in mind that this is not Black Friday at Walmart - this is someone’s home who passed away. Always be respectful. I only joke about killing people in the driveway who get away with the goods I wanted. But I would never actually do it, of course. I typically head either right to the kitchen or right to the woman’s closet - but it all depends on the pictures. Let’s just say I have a target in mind for the first thing I want to try to snag. I’ve scored some unbelievably cool additions to my wardrobe. Often for like $10, maybe $20? A once-in-a-lifetime dress - something that the elite women wear, that you get to wear to that upcoming event in your schedule. Or that beautiful winter coat for those Colorado winters. 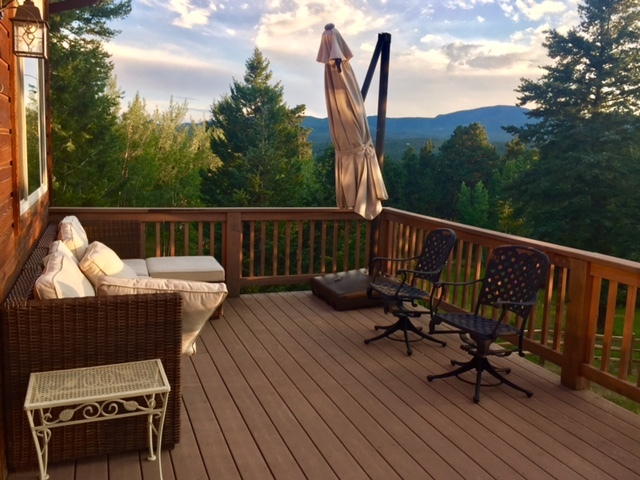 It's got to be this set of table and chairs that we have in our home in Evergreen. It's a solid marble dining room table with 8 stunning designer leather chairs that I picked up at an estate sale in Colorado. I estimate that the original owner paid at least $5,000 and probably more like $7,500. I found the chairs online at over $700 a piece, and there's 8, so that's $5,600 for them alone. That doesn't include the solid marble table! There ya go. I just spilled all my secrets, and now I might have some fierce competition. But I always love passing on what I’ve learned. And who knows…maybe in another year, I’ll have learned twice as much. That I will, of course, share with you all over again.